Reducing readmissions is a national priority for payers, providers, and policymakers seeking to improve health care and lower costs. Readmissions are a significant issue among patients with Medicaid. The Agency for Healthcare Research and Quality (AHRQ) commissioned this guide to identify ways evidence-based strategies to reduce readmissions can be adapted or expanded to better address the transitional care needs of the adult Medicaid population. 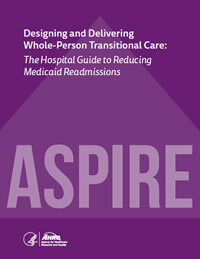 The guide has been field tested by individual hospitals and groups of hospital quality improvement collaboratives. Based on a series of coaching and feedback calls with hospitals, the second release of this guide has been updated to provide updated tools and clearer guidance on who should use the tools and what to do with the output of the tools. It also offers new tools that can be used in the day-to-day working environment of hospital-based teams and cross-setting partnerships. Prepared for the Agency for Healthcare Research and Quality under Contract No. HHSA290201000034I. This document is in the public domain and may be used and reprinted without permission except those copyrighted materials noted for which further reproduction is prohibited without specific permission of copyright holders. No investigators have any affiliations or financial involvement (e.g., employment, consultancies, honoraria, stock options, expert testimony, grants or patents received or pending, or royalties) that conflict with material presented in this report. The authors of this guide are responsible for its content. Statements in the guide should not be construed as endorsement by the Agency for Healthcare Research and Quality or the U.S. Department of Health and Human Services.